Recently, Ground Penetrating Radar Systems (GPRS) was requested on site by a general contractor to perform a Ground Penetrating Radar (GPR) scan at the Southerly Waste Water Treatment Plant. The purpose was to locate any conduits and rebar in the concrete slab. The contractor didn’t want to hit any rebar or electrical conduits during core drilling. All rebar and conduits were marked out in areas of concern and the general contractor was able to safely drill holes without hitting any rebar or conduits. Ground Penetrating Radar Systems is the best way to ensure the locations of reinforcement and conduits prior to saw cutting/drilling through concrete. 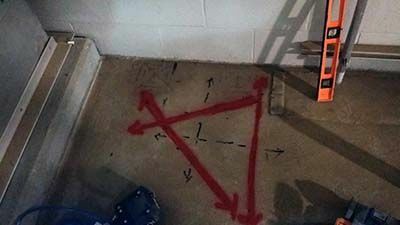 The pictures above and to the right show electrical conduits (red paint) and rebar (black marker dashed lines) marked out on site where core drilling took place. For more information on how GPRS, LLC. can help you on your next project, please contact Micah Stair at (330) 639-8933 or by email at micah.stair@gprsinc.com. We also have the capabilities of locating reinforcement in a concrete slab along with any underground utilities.